I spent High School in Japan. I lived in Shibuya and went to The American School in Japan in Chofu. I grew up in Shibuya. Back then, in the early 80’s, Shibuya was a hot area of Tokyo. Brands like Van Jacket, Domon, Jun, etc. and the “Shibuya Casual” or “shibukazi” scene were getting a lot of attention. Shibuya was full of bars, clubs, restaurants, clothing shops and places to just hang out on the street. As a teenager, I spent a lot of time “on the street” buying liquor from vending machines, chasing rats and going to game centers and clubs. Back then, it didn’t really matter if you were underaged and the discos were packed with Jr. High School aged kids. I went to my first nightclub in 9th grade. 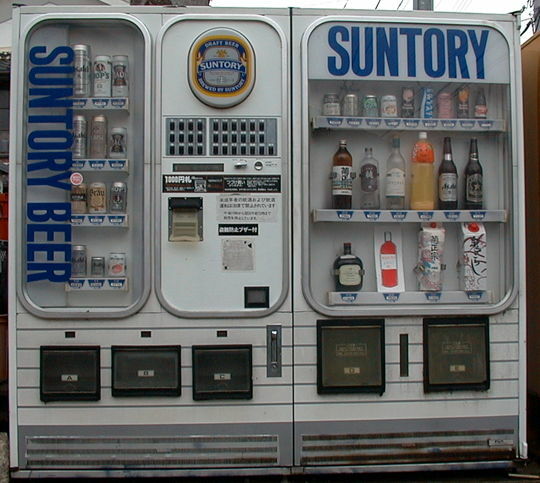 You could buy bottles of whiskey, Suntory White, in vending machines. During summers I hung out in the fashion buildings, sometimes helping in the shops and always going out with the designers, shop staff and hair dressers after work. The Japanese bubble was just getting going and everything felt like an endless drunken party and a explosion of consumer brands and excess. Later, after I first dropped out of college, I returned to Shibuya to run an after hours club at the end of Center Gai. That’s where I met Hyperdelic Video and a lot of my “crew”, many of whom I still work with. I also met Keith who was running Tower Records at the time. I used to have him let me put my club flyers there. I was probably just a scrappy little kid to him then. When we first moved to Shibuya, we lived in a fancy house paid for by my mother’s employer, ECD. Later, we had to move to a dumpy little two room apartment made from a converted love hotel. That’s when I hung out the most with Keigo (Cornelius) who was living with his mother in the same apartment building. Walking around Shibuya at 7AM this morning brought back memories of all-nighters and the craziness of my teenage years in Tokyo. I shot some photos and uploaded the set to Flickr. I discovered your life and blog yesterday after listening to takako minekawa songs and looking for some information about her and cornelius. woooh shibuya in the 80's... sounds great and I miss the times I could not live since I was born in 79 in france, paris in the 80's was great as well (hearing the stories of friends older than me that lived these years). yet I think these times are out but the new times can be great as well, just have to decide it to live it, isn't it? now french designer in tokyo and research student in musabi I thought it could be interesting to meet you if you have some time.?..?. Regarding whiskey sold in vending machines: When I took a business trip to Japan many many years ago, I noted this unusual (to Americans) practice and happened to mention it to my hosts. IIRC they flatly denied that any such thing existed. Good to know I wasn't hallucinating! Joi, I think it is time you shared with us a "Tokyo hitotoki"! We have launched in Japanese too recently, and even in New York last week. > I lived in Shibuya and went to The American School in Japan in Chofu. Ah yes indeed you did and when Adair Nagata asked me to teach you pascal programming on the Apple II you were much more intrested in talking about the trampoline you were getting built in your front garden. AND now look at you - the computer guru Well done Joi. Oh, and I'm surprised you managed to find a place to take the photo of the people at the train station without getting trampled and run over! shibuya is just 5 minutes from my place and I like specifically to go there very early in the morning. Last drunk people of the previous night, legal or "on the spot" couples coming out of love hotels, cleaning people trying to wash out the flow of people. You hear many tokyoites saying bad things about Shibuya, but they experienced only the crowded hours of the place. There are wonderful things about this part of the city. I have seen poor gankuro girls dealing with dramas at night on the sidewalk or partying birthday on the concrete with candles on a cake. There are homeless people that are there since I have first been in Tokyo in 2001 and some who disappeared. Every places, no matter how washed out by the crowd or the popularity, has its own local intimate life. You just have to sit, stay, and watch long enough, at a regular pace to discover it. 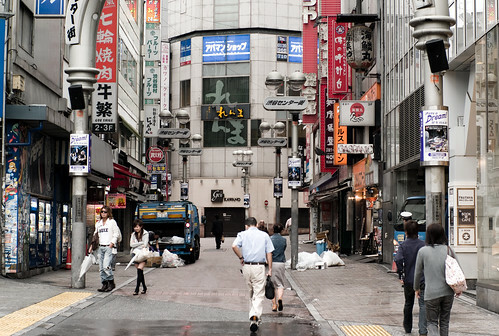 Looking forward to seeing Shibuya when at the Web 2.0 Expo - thanks for the post Joi. I saw you at the Web 2.0 expo and stayed at Excel Hotel right smack in Shibuya station. It's an incredible place to see so many people, so much action and yet, in a strange way, serenely peaceful. I found a store around the corner that sold simply the best soba served with pork belly soup ever! Hi Joi. I've lived in Tokyo for a while and I'm a very big fan of Flippers Guitar. Found your blog post about 80s Shibuya, which is very interesting. Great you kind of lived together with Keigo! Unfortunately I could never experience Shibuya during that time because I was born around 10 years later. Cheers! Joi Ito - "Shibuya in the morning" by Joi Ito is licensed under a Creative Commons Attribution 4.0 International License.